Several years on from the semi-privatization of its oil sector, Mexico has lined up tens of billions of dollars of potential investment in offshore drilling. But just as the fruits of the energy reforms are becoming visible, the entire effort is at risk as the political winds shift against it. 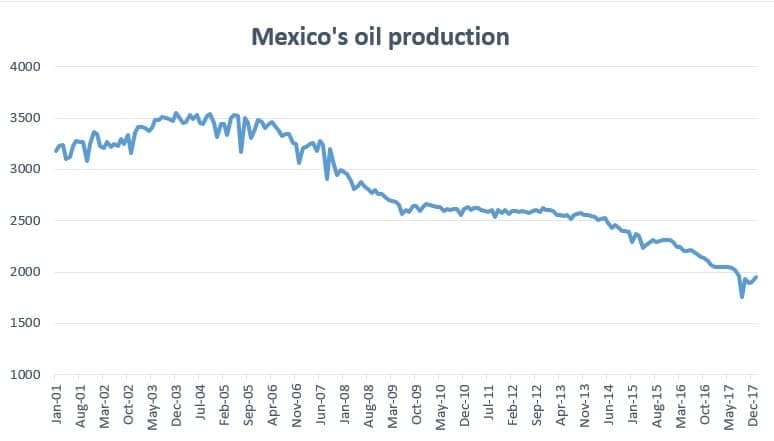 Mexico’s oil production has been in steady decline since the mid-2000s, having peaked at just over 3.5 million barrels per day (mb/d). The country’s oil fields are decades-old and losing production, including the Cantarell field, which was once one of the largest producing fields in the world. But it has been in decline for years. The losses from Mexico’s aging oil fields accelerated in 2014 during the oil market downturn, and output fell below 2 mb/d last year. State-owned Pemex has controlled the oil sector for decades, but that changed under the liberalization effort in 2013-2014. Since then, the state has auctioned off dozens of fields, which could theoretically translate into upwards of $100 billion in investment. Pemex will need the help. Not only has production declined precipitously, but the company’s reserves are also deteriorating. In 2017, Pemex only replaced 17.5 percent of the volume of oil and gas that it produced. Oil companies tend to aim for a 100-percent reserve-replacement ratio, ensuring that they at least replenish the amount of oil extracted from their assets. But that has been an unrealistic goal for Pemex. Glaringly, the 17.5 percent reserve-replacement rate last year was actually a serious improvement over the 4 percent replacement rate in 2016. At current production rates, Pemex has just 7.7 years of reserves left. However, international companies have flocked to Mexico in recent years following the historic opening of the energy sector. Along with Brazil, Mexico is one of the few highly attractive areas for offshore drilling in the world. The U.S. Gulf of Mexico is obviously a critical region for the private oil industry, but it is also well-developed. Recent auctions by in the U.S. Gulf have drawn scant interest. Meanwhile, the oil majors have gone all-in on Mexico’s recent auctions, with companies like Shell, ExxonMobil, Eni and Chevron competing for some of the most attractive acreage. But the Mexican people have not really felt any tangible benefits from the privatization. The campaign to end the state monopoly was controversial at the time, sold with lofty promises of economic growth and a windfall for the people. With the benefits elusive, the ruling government has fallen out of favor (although there are plenty of other reasons for declining popularity) and so has the energy reform. The next President is likely to be Andres Manuel Lopez Obrador, a leftist often described as a threat to the oil industry. It is unclear if that will be the case. He has promised to end or slow the oil auctions, pending a review. However, he has vowed not to roll back the privatization effort, which, in any case, cannot be undone without a constitutional change. One intriguing area to watch is in the realm of local content rules. Lopez Obrador’s top energy advisor, Rocio Nahle, seemed to support 80 percent local content rules for oil and gas projects in a tweet on May 20. Strict local content rules in Brazil – prior to their easing over the past year – are often cited as a major deterrent in past auctions, scaring away investment. Any hike in Mexico’s local content rules would be opposed by the oil industry. Meanwhile, Lopez Obrador has promised massive public investment in refineries, as the half-dozen of Mexico’s large refineries are in poor shape. Falling output has ensured that Mexico has had to import refined products from the United States. Lopez Obrador has said he wants to end or curtail crude exports from Mexico and instead use that oil domestically to build up the refining sector. It is not at all clear that this will be a boon for Mexico’s budget, its people, or for Pemex. Such an effort might not hit the international oil companies who have acquired acreage offshore, but it would be bad news for U.S. refiners if it cut into Mexico’s refined product imports. Overall, as of now, Lopez Obrador does not appear to present a mortal threat to the drilling interests of the oil majors who have bet on Mexico’s offshore sector. He may slow, but won’t reverse the energy reforms. Could Venezuela Prompt OPEC To Pump More? Nick, enjoyed the article. Mexico shows great potential. What is the source for the oil production graph contained here?